This chart (click chart for larger version) shows the levels of tritium in Indian Creek since November 2005, when our environmental monitoring program detected low levels of tritium in Indian Creek for the first time in its 35-year history, well below the federal water standards that Fermilab is required to meet. The detection limit is one picocurie per milliliter (see footnote below). 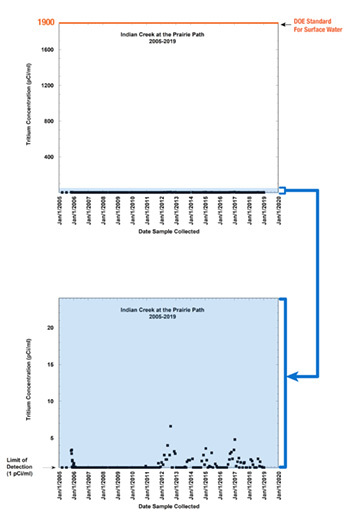 Fermilab continues to monitor Indian Creek frequently and the results are displayed on this page. A frequently-asked-questions page provides more information, and we have posted an aerial view of Indian Creek as well. State of Illinois agencies have taken water samples from Indian Creek in the past as well and confirmed the accuracy of Fermilab's measurements. About the graph: A solid dot appears on every day in which a sample has been taken and analyzed. Samples with no detectable level of tritium are represented by a solid dot on the line at the bottom of the graphic. Footnote: A picocurie is the unit used to specify how many tritium particles in a water sample decay into helium particles each second. Standard tests can detect levels of tritium in water that are larger than about 1 picocurie per milliliter. The Department of Energy surface water standards specify a limit of 1900 picocuries per milliliter.